The innate human desire to understand the origins of our own world and our place in the universe fuels the questions EAPS scientists seek to answer. Questions such as: How do planets form and evolve? What role do atmospheres play in their evolution, and how might this inform us about our own environmental changes? 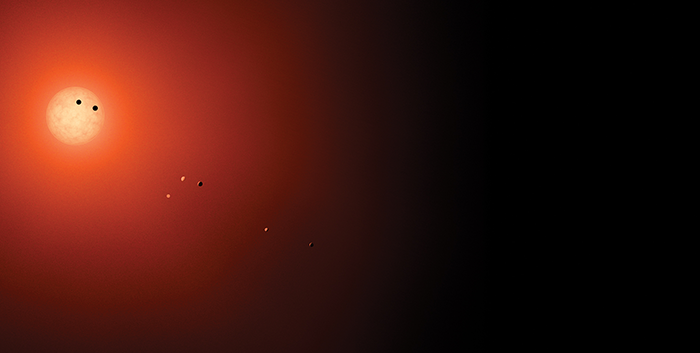 What can exoplanets tell us about our own solar system? Do other Earth-like planets exist? Could they be harboring life? Since the first astronomy course was taught in the department in 1956, EAPS scientists have been making major discoveries and leading pioneering missions across our solar system and beyond. With advances in radar mapping we provided the Apollo program with the first detailed topographic maps of the Moon. We laid the groundwork for the Mariner 10 mission’s discovery of Mercury’s magnetic field and probable molten core, and the recent high-resolution gravitational maps of the Moon and Mars. Our research has led from finding the first evidence of Pluto’s atmosphere to the startlingly beautiful photos of Pluto’s icy surface taken by the New Horizons spacecraft. And our scientific gains have very practical applications. The first detection of an atmosphere on an exoplanet has driven innovations in satellite technology and instrumentation, laying the groundwork for projects like the TESS (Transiting Exoplanet Survey Satellite) space telescope, designed to find planets orbiting bright nearby stars, scheduled to launch in 2018. With boundless curiosity, EAPS planetary scientists and students break boundaries between disciplines, integrating the fields of physics, chemistry, biology, astronomy, and the geosciences. We explore the outer limits, collecting data not just from telescopes all over the world and in space, but also from field observations, radar, robotic probes and landers—and, of course, from experiments in the lab, computer simulations, and mathematical modeling—as only MIT can. 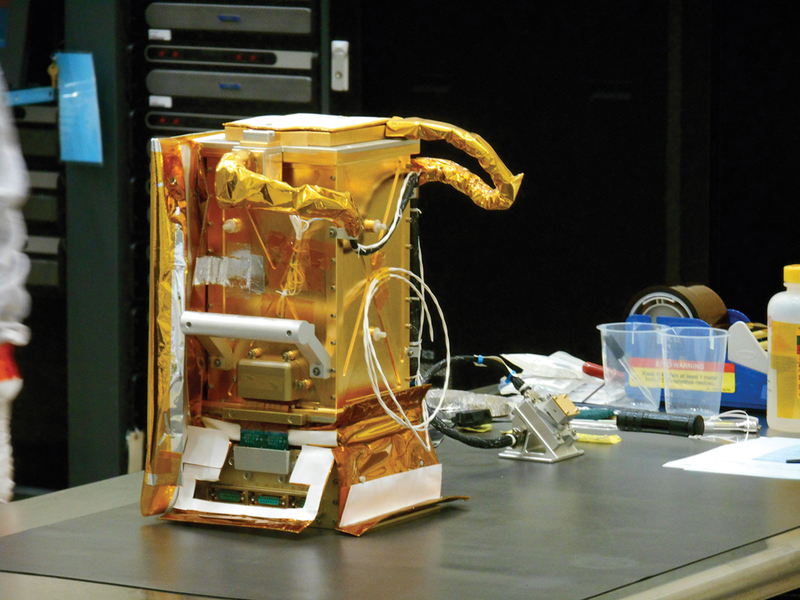 Many EAPS faculty are engaged in NASA missions: most recently the New Horizons mission to Pluto that beamed brilliant images of the icy dwarf planet back to Earth. EAPS alumna Cathy Olkin ’88, PhD’96 was Deputy Project Scientist on the New Horizons team that also starred EAPS Professor Richard P. Binzel, along with other EAPS alumni and graduate students. In 2011, former EAPS Department Head Professor Maria Zuber, now MIT’s Vice President for Research, became the first woman to lead a NASA spacecraft mission as PI for the Gravity Recovery and Interior Laboratory (GRAIL) mission that explored our moon’s gravity field and geological structure. Other current missions with key EAPS faculty involvement include the Arcsecond Space Telescope Enabling Research in Astrophysics (ASTERIA), the Transiting Exoplanet Survey Satellite (TESS), and the OSIRIS-REx mission to bring back asteroid samples to Earth. And in January of this year, NASA announced its selection of two new robotic missions: the first to study and map the metal asteroid Psyche; and the second called “Lucy,” which is a first reconnaissance of the population of primitive asteroids orbiting in tandem with Jupiter called the Trojans. The Psyche mission—which includes prominent roles for Maria Zuber (leading the gravity investigation), Richard Binzel (asteroid composition expert), and Benjamin Weiss (leading the magnetometer investigation)—is led by former EAPS professor Lindy Elkins-Tanton ’87, SM ’87, PhD ’02, now director of Arizona State University’s School of Earth and Space Exploration. Meanwhile, the Lucy mission again involves Richard Binzel and EAPS alumna Catherine Olkin ’88, PhD ’96, who serves as a deputy principal investigator. Planetary Sciences Professor Ben Weiss runs the Paleomagnetism Laboratory with its magnetically shielded clean rooms which can measure the magnetic properties of extraterrestrial samples. The Lab focuses on interdisciplinary problems in planetary science, geology, and geophysics, like the history of solar system magnetism and planet formation, and developing sophisticated new magnetometry instrumentation to accompany NASA and European space missions. Our own Wallace Astrophysical Observatory—which was once directed by James L. Elliot (1943-2011), professor of planetary astronomy and physics at MIT, whose research led to groundbreaking discoveries of the rings around Uranus and Pluto’s atmosphere—now hosts six telescopes, including two with their own domes. 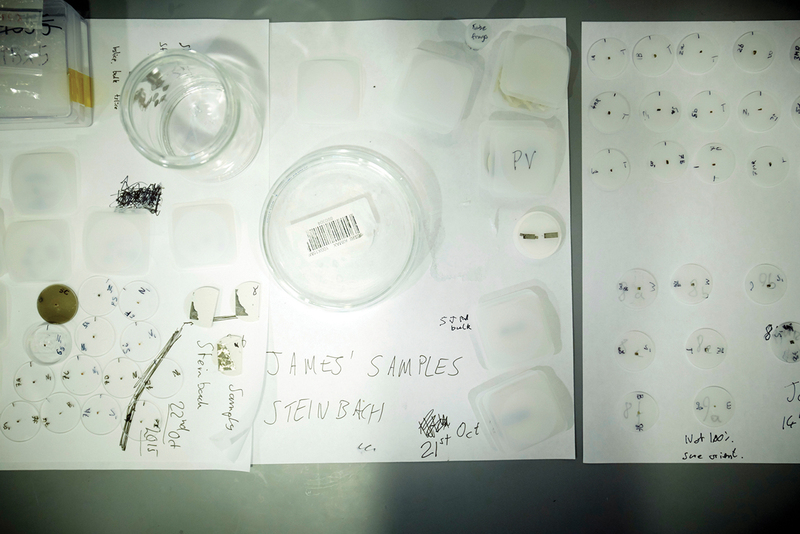 Our methods and techniques are as diverse as our research topics. We also investigate Earth-like processes such as tectonics, sedimentary layering, riverbeds, and glaciers at distances that range from Mercury to Pluto. Signs of ancient rivers and oceans could indicate the presence of life, and the evolution of atmospheres and climates of other planets could lead to further discoveries about our own climate and its future trajectory. And we learn how planets form, studying meteorites more than 4.5 billion years old and sampling the remnant building blocks of planets that survive today as asteroids and comets. 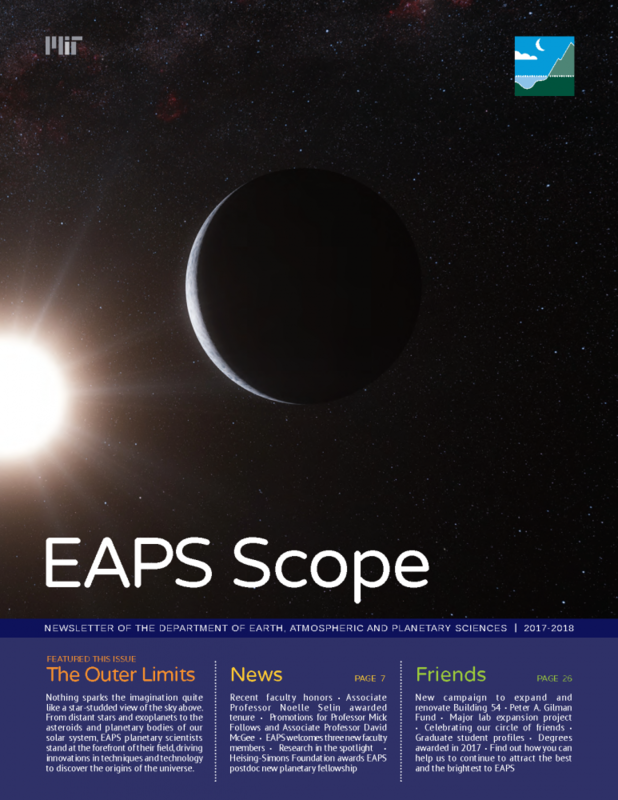 In this issue of EAPS Scope, we take a deep dive into planets. Among the many stories in these pages, you can learn about Sara Seager and TESS, the space telescope launching in 2018 designed to find temperate, rocky planets orbiting bright nearby stars, with the goal to identify targets that could be well-suited for the detection of life with the powerful James Webb Space Telescope. You will hear from postdoc Julien de Wit—soon to become a junior faculty member in EAPS—who is leading MIT’s collaboration in the SPECULOOS project, a network of small, ground-based telescopes with a similar goal, in search of terrestrial planets around nearby ultracool dwarf stars. Closer to home, read about research scientist Christopher Carr who is working with Maria Zuber on the Search for Extraterrestrial Genomes project (SETG) to build a sequencing tool to enable the isolation, detection, and classification of extant or preserved organisms on Mars, Europa, and Enceladus. You will hear of the adventures that await asteroid explorer extraordinaire Richard Binzel over the next decade, including three projects designed by MIT students. From Ben Weiss’s lab, hear how the magnetic fields of meteorites can offer important new insights into the timeline of our solar system and the early composition of planetary bodies. 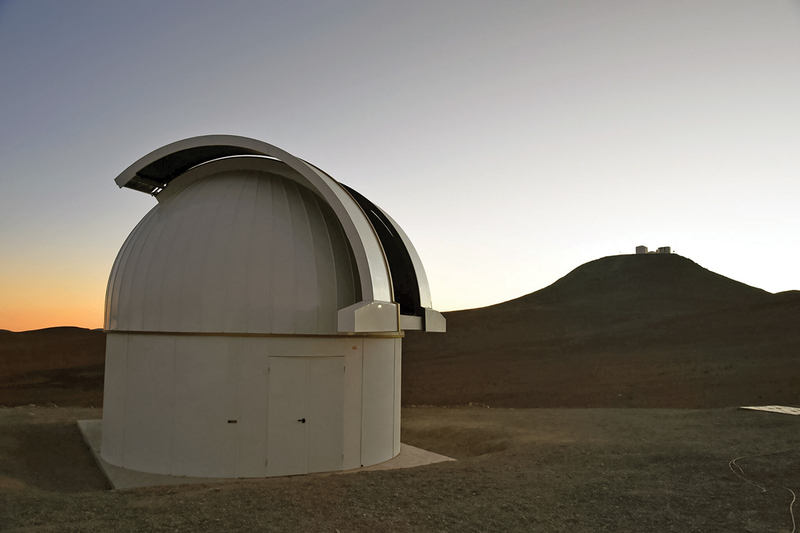 And, last but not least, read about the jewel in EAPS crown that is the Wallace Astrophysical Observatory, a powerful observational astronomy incubator which has steered generations of EAPS students into careers in planetary science and space exploration over almost five decades.